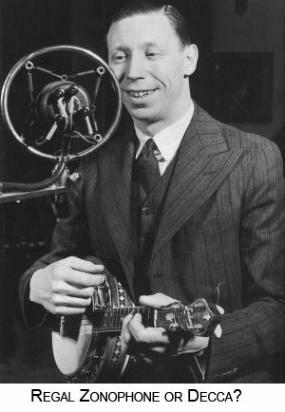 The recording has now been heard in full by enough people both GFS members and just people browsing the web and the opinion seems to be that this is definitely not George Formby. More people have also expressed the opinion that it could be Frank Formby but the members of The Shellac Collective were adamant that Frank just wouldn't have had the clout to get inside Decca's studios. Personally I think that they are doing Frank a bit of a disservice with their dismissiveness of his name. Consider the fact that Frank appeared in theatres through the UK in the late 30's and 40's and he also appeared in a Pathe News clip in 1935, singing one of his dad's songs (he comes on at 2:20). He also appeared on Radio Luxembourg in 1938 - so why wouldn't Decca think to at least audition him after losing his big brother to the rival EMI Regal Zonophone setup? If not Frank then who? Listeners have emailed to suggest that the mystery singer's playing just isn't up to George Formby's standard and some have suggested that the instrument doesn't sound like the Ludwig/Abbott/Gibson instruments that GF played. 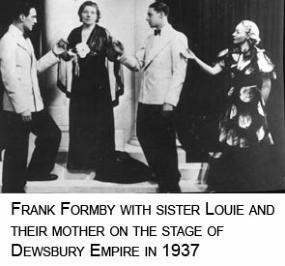 We will probably never know the true identity of the mystery singer - Frank Formby (as far as we know) never officially recorded anything but if you want to hear what he sounded like in later life, there is a recording that Dickie Speake gave to me which comes from a GFS meeting that Frank attended. You can listen to it in a second player below. Have a listen to Frank Formby singing the full version here. The whole song is a bit of a mystery! Peter Pollard writes, "We would like everybody to listen in to the show and details of how to receive the broadcast are listed below. There are many arguments for and against the validity of the recording but I wouldn't want to influence anybody either way before the broadcast date, perhaps afterwards we can open the discussion to all interested parties". Update - 15/03/2012 Having listened to the broadcast I think the presenters on Cambridge 105 FM did a very fair job of showcasing the recording. They certainly were not biased and discussed quite a few possibilities as to how this recording had been created. I honestly think that all Formby lovers would really like this to be George but I am still not convinced. Perhaps this subject will run and run - and why not? Greg Butler of Cambridge 105 FM writes: For everyone who missed the Kipper the Cat Birthday Party Radio Show which played the new "George Formby" find - It is now available as a podcast. It looks from the poll results and comments that this probably is NOT George. But, we are No further forward working out just who it is that had been allowed into Decca's studios in March 1938 to cut this side! Clearly they were trying to sound like George - But there does not appear to have been an impersonator around at that time that it could have been... anymore ideas anyone ?? Have a listen to the full version here You can tune in on-line at www.cambridge105.fm The Kipper The Cat show goes out fortnightly and plays a good mix of previously or rarely unheard interesting tracks mainly from shellac recordings. 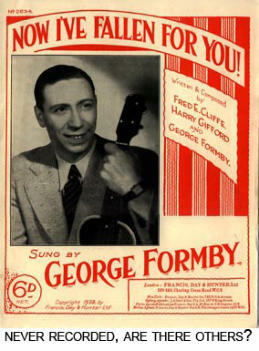 A very interesting recording has been discovered which the finders claim is likely to be George Formby, singing on a Decca recording in 1938. The finders are known as The Shellac Collective and their spokesman Greg Butler has exchanged numerous e- mails with me about the validity of the recording. 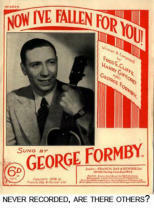 A portion of the recording has been played to quite a few well known members of the George Formby Society and all have expressed doubts that it is Formby and two of the listeners offered the suggestion that it might possibly be Frank Formby, one of George’s younger brothers who did work in theatres throughout the UK. The finders are not convinced by our members statements and whilst we shall never really know if it is or is not George Formby listening to clip hear and to the broadcast on Tuesday evening will perhaps help to decide the issue. Shellac Collection spokesman Greg Butler writes, "The Shellac Collective have uncovered a Decca Test pressing from 1938 of an unknown solo demo recording which they think is by George Formby and which is causing a great stir in George Formby Society circles. Some "experts" are unsure that it really is George Formby - Some think it could be his brother Frank Formby - Some think it might be an impersonator - But no-one yet has been able to give a better explanation than that this is simply George cutting himself a demo of a song he is trying out. Why this was done at Decca and not in the Regal Zonophone studios where he was contracted nobody knows... and adds to the mystery. The 78 test plate was pressed in heavy vinyl on the orders of Decca Producer Geoff Milne in the late 1960's / early 1970's. He ordered a mass pressing to be done of one off masters because Decca were just about destroy all their stock of old plates to free up space in their offices, and this 78 was found amongst a discarded box of these discs! The record has the matrix number TB 3600 which would date it at around October 1938, and because it just has a blank white label it has been given the working title "You can tell him by his little ukulele" which is the hook line in the song. The record is just "George" accompanied by his Uke (NOT a banjolele!) it is clearly a work in progress and not a finished song as he hasn't really bothered to polish up the solo and kind of makes it up as he goes along.... The whole song is a bit of a mystery! Peter Pollard writes, "We would like everybody to listen in to the show and details of how to receive the broadcast are listed below. There are many arguments for and against the validity of the recording but I wouldn't want to influence anybody either way before the broadcast date, perhaps afterwards we can open the discussion to all interested parties". Update - 15/03/2012 Having listened to the broadcast I think the presenters on Cambridge 105 FM did a very fair job of showcasing the recording. They certainly were not biased and discussed quite a few possibilities as to how this recording had been created. I honestly think that all Formby lovers would really like this to be George but I am still not convinced. Perhaps this subject will run and run - and why not? Greg Butler of Cambridge 105 FM writes: For everyone who missed the Kipper the Cat Birthday Party Radio Show which played the new "George Formby" find - It is now available as a podcast. It looks from the poll results and comments that this probably is NOT George. But, we are No further forward working out just who it is that had been allowed into Decca's studios in March 1938 to cut this side! Clearly they were trying to sound like George - But there does not appear to have been an impersonator around at that time that it could have been... anymore ideas anyone ?? Have a listen to the full version here You can tune in on-line at www.cambridge105.fm The Kipper The Cat show goes out fortnightly and plays a good mix of previously or rarely unheard interesting tracks mainly from shellac recordings.